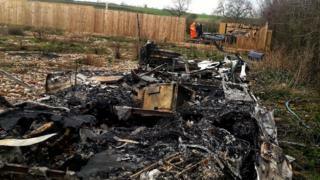 Seven caravans were found alight on Monday night at a site off Sandy Lane, Melton Mowbray. The site has been allocated for travellers but was not being used at the time of the attack. There are no reports of other property being damaged or anyone injured. Police have asked anyone with information about the attack to contact them. The fire and rescue service said they used three appliances to fight the fire but had to call in a water carrier when mains supplies ran low.